The most difficult part is cutting the green plantains because they tend to be a bit hard and difficult to peel. To make them, start off by cutting both tips of the plantain and then cut the plantain into thick pieces, about 5 to 6 pieces (1 1/2 inches each). Use a knife to peel the plantains. This method has proven the easiest way for me to peel green plantains. Add oil to a pan and let reach 375°F. When the oil reaches this temperature start adding the plantains and fry for a few minutes. Remove the pieces and place in a plate lined with paper towels. While they're still hot, mash them one by one with a tostonera or use the bottom of a glass cup to add pressure to create your tostones. Once the tostones are formed, fry them again in the same oil until they've browned. 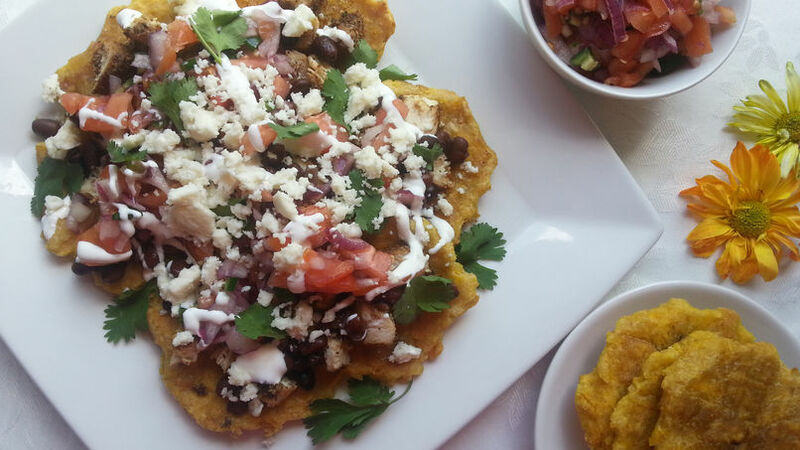 To create the nacho tostones, just place the tostones on a plate and add the chicken, beans, onion, tomato and cilantro. Finally, sprinkle with lemon juice and add the queso fresco and cream. Season with salt to taste. This recipe is great for left over beef, chicken or pork. Tostones are a Caribbean snack usually served as a side or an appetizer before the meal. Tostones are made with green plantains and are also called patacones in Latin American countries like Colombia, Panama, Peru and Venezuela. They can also be found in Haiti, where they are called banana pese. I discovered tostones in Puerto Rico and I became fascinated with their taste and how many versatile recipes they can be used in. Today I want to share my Mexican version of nacho tostones with black beans, grilled chicken, jalapeños, Mexican salsa and queso fresco (Mexican white cheese). Enjoy!